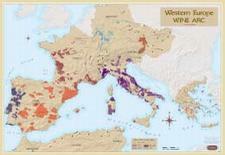 Europe Wine Maps from Omnimap, a world leading international map store with over 250,000 map titles. Wine Map of Europe. Editions Benoit. A colorful map that shows the wine regions throughout Europe. In French. Size is 35 x 26". Europe Wine Map (wall map). Vinmaps. From Oporto to Athens travel along and chat with your friends about the varied and fascinating wine arc of Western Europe; regions draped over beautiful topography. Size is 26 x 38".